How I Spent My Winter Vacation. 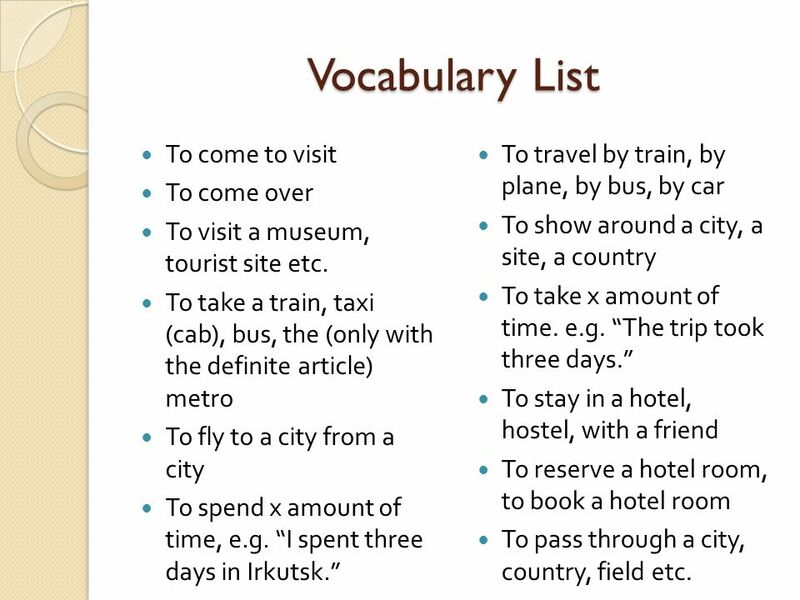 Vocabulary List To come to visit To come over To visit a museum, tourist site etc. To take a train, taxi (cab), bus, the. 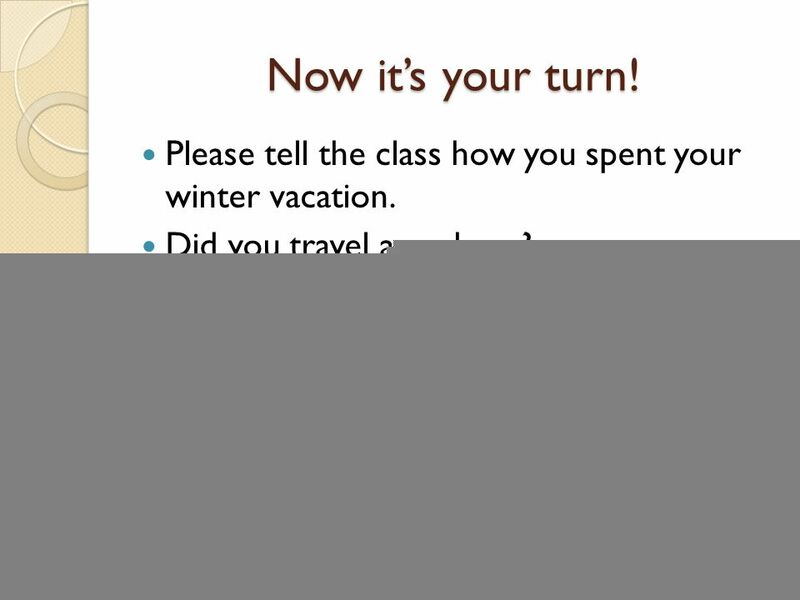 2 Vocabulary List To come to visit To come over To visit a museum, tourist site etc. To take a train, taxi (cab), bus, the (only with the definite article) metro To fly to a city from a city To spend x amount of time, e.g. 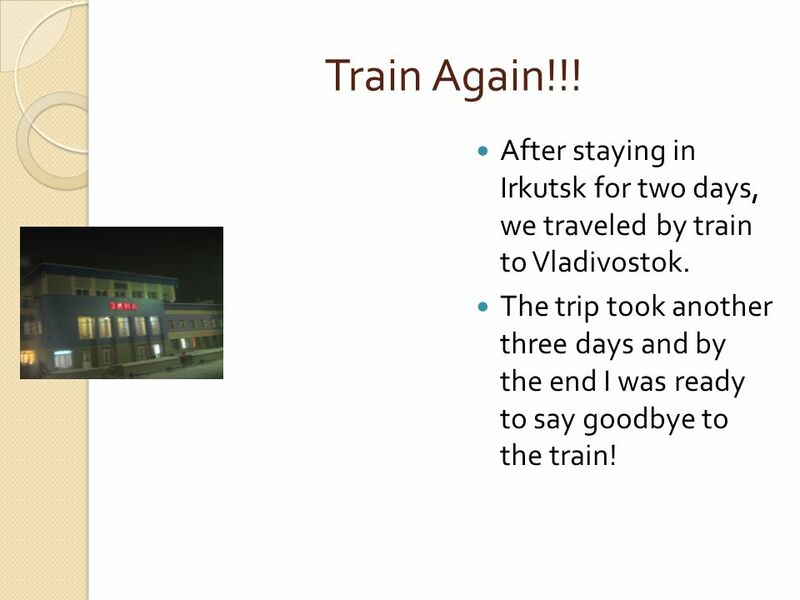 “I spent three days in Irkutsk.” To travel by train, by plane, by bus, by car To show around a city, a site, a country To take x amount of time. e.g. “The trip took three days.” To stay in a hotel, hostel, with a friend To reserve a hotel room, to book a hotel room To pass through a city, country, field etc. 4 Moscow After New Year’s I flew from Kurgan to Moscow. 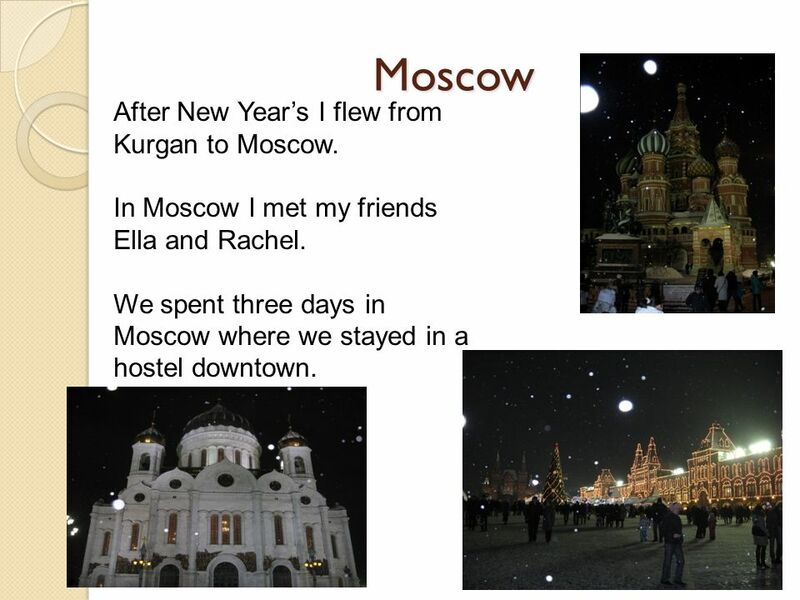 In Moscow I met my friends Ella and Rachel. We spent three days in Moscow where we stayed in a hostel downtown. 5 Train!!! 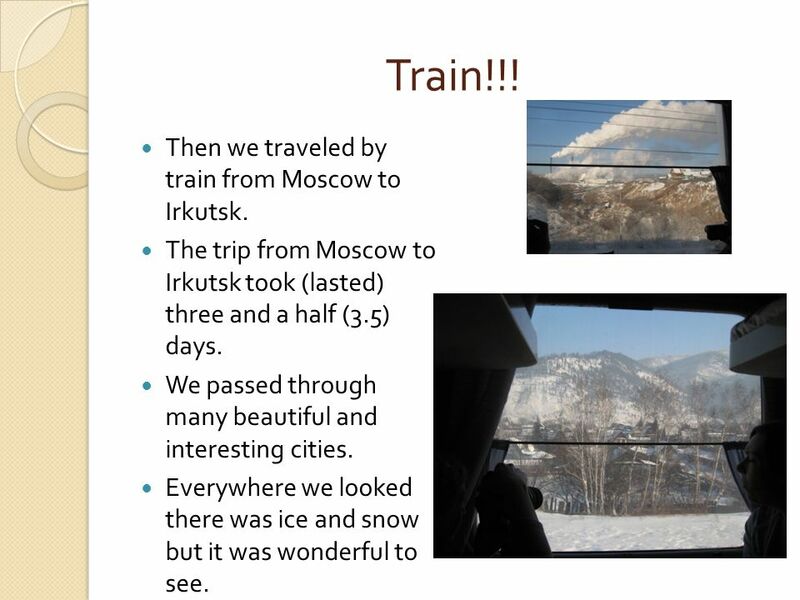 Then we traveled by train from Moscow to Irkutsk. The trip from Moscow to Irkutsk took (lasted) three and a half (3.5) days. We passed through many beautiful and interesting cities. Everywhere we looked there was ice and snow but it was wonderful to see. 6 Irkutsk We spent two days in Irkutsk. We met a professor from Irkutsk State Linguistic University and his student there. Nastia showed us around the city and was very friendly and helpful. There was a lot of ice everywhere and we slipped on it. 7 Baikal We took a bus to Lake Baikal, where we spent the day sliding on the frozen lake, taking pictures and eating in the cafes around the lake. I bought a few smoked omul and we also visited the Baikal museum where we saw Baikal seals swimming in an aquarium. 8 Train Again!!! After staying in Irkutsk for two days, we traveled by train to Vladivostok. The trip took another three days and by the end I was ready to say goodbye to the train! 9 Vladivostok Finally we arrived in Vladivostok at the edge of the Pacific Ocean. 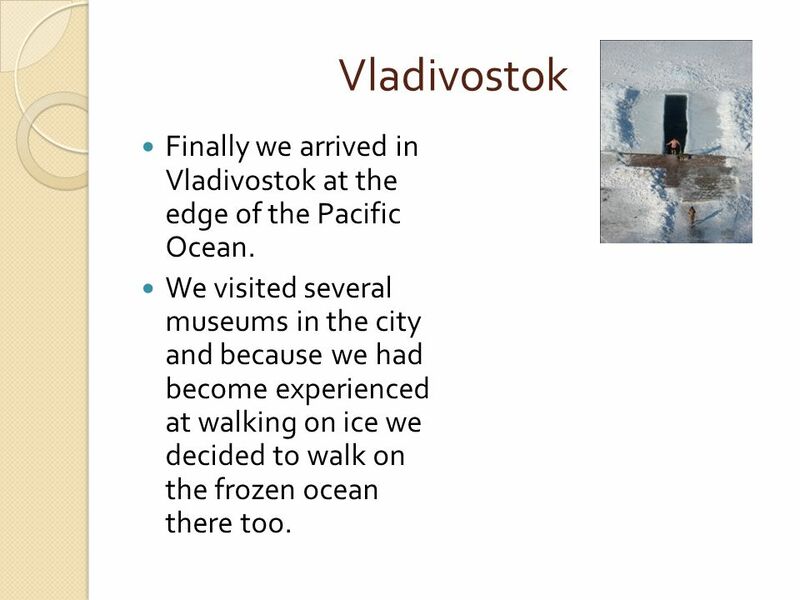 We visited several museums in the city and because we had become experienced at walking on ice we decided to walk on the frozen ocean there too. 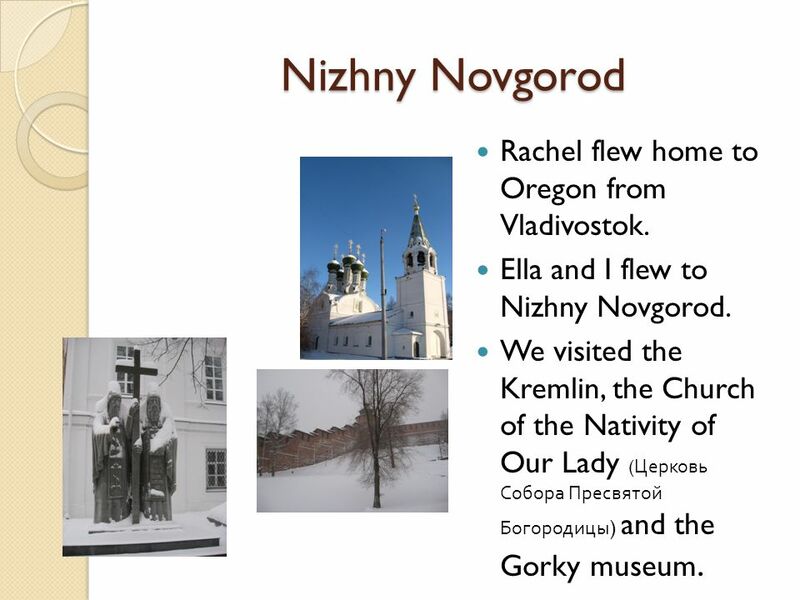 10 Nizhny Novgorod Rachel flew home to Oregon from Vladivostok. Ella and I flew to Nizhny Novgorod. We visited the Kremlin, the Church of the Nativity of Our Lady ( Церковь Собора Пресвятой Богородицы ) and the Gorky museum. 11 Kazan Ella and I then traveled by train from Nizhny Novgorod to Kazan. 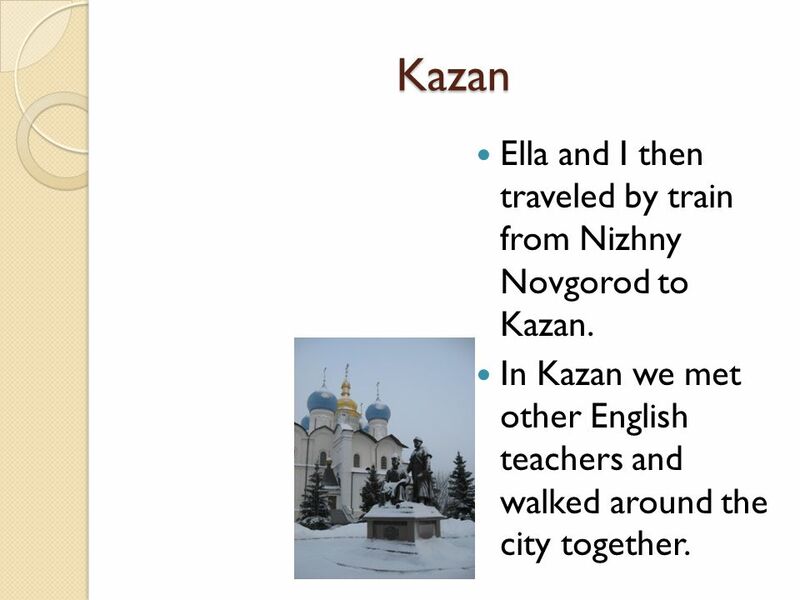 In Kazan we met other English teachers and walked around the city together. 12 Back to Moscow!!! 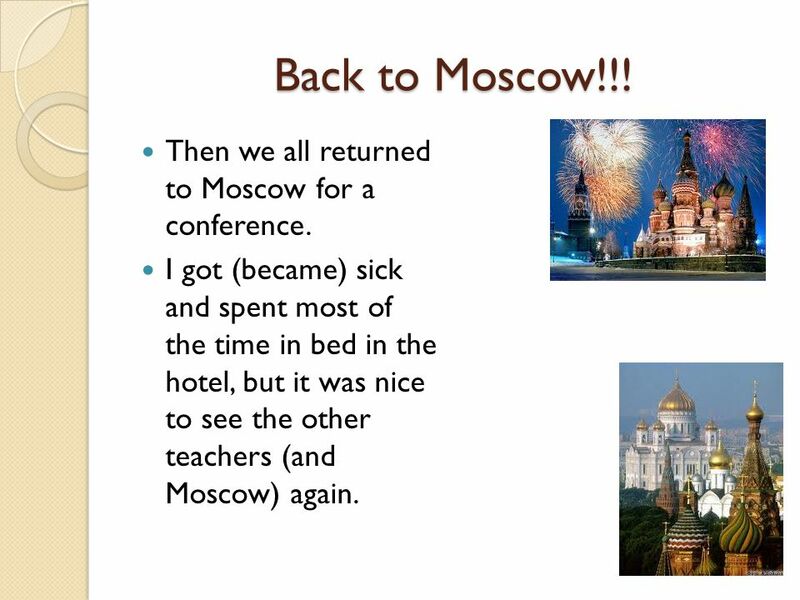 Then we all returned to Moscow for a conference. I got (became) sick and spent most of the time in bed in the hotel, but it was nice to see the other teachers (and Moscow) again. 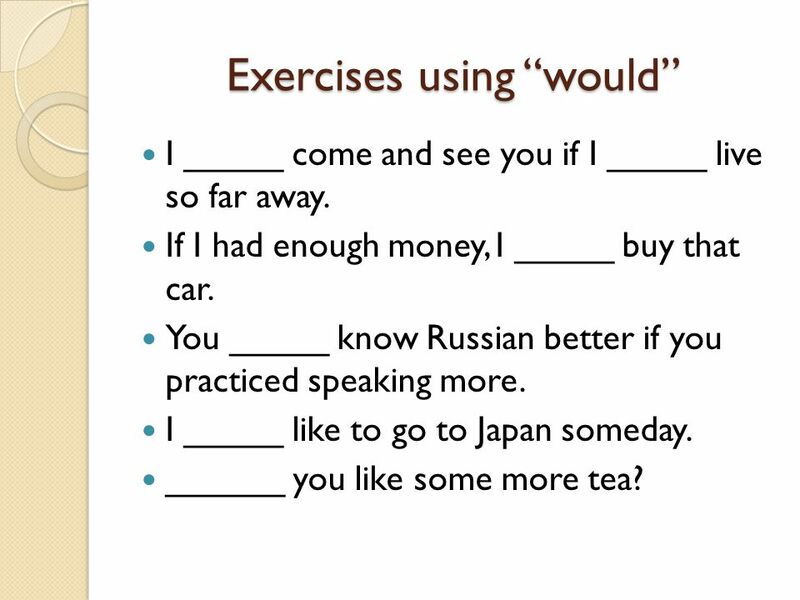 20 Exercises using “would” I _____ come and see you if I _____ live so far away. If I had enough money, I _____ buy that car. 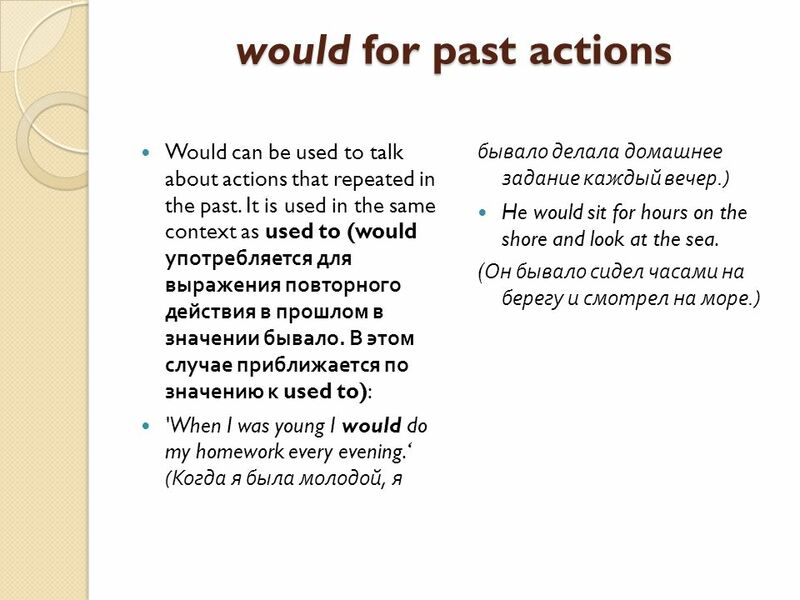 You _____ know Russian better if you practiced speaking more. I _____ like to go to Japan someday. ______ you like some more tea? 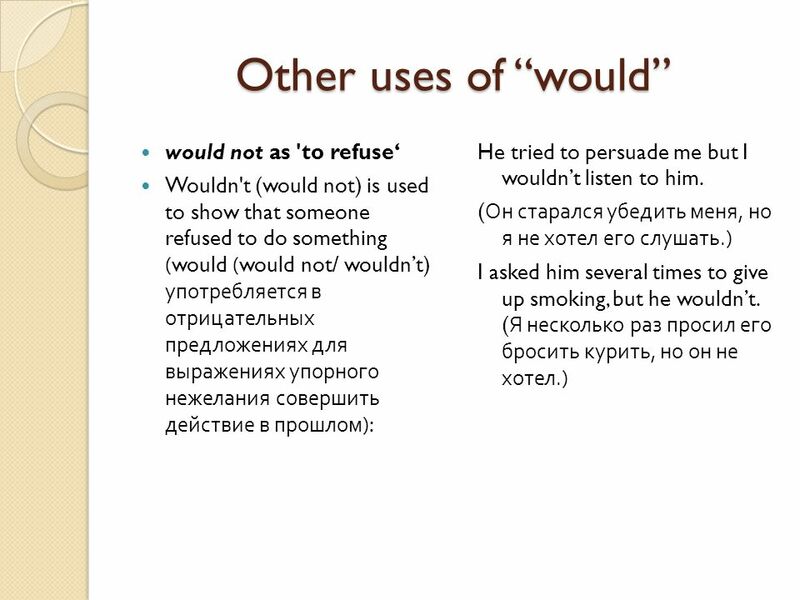 21 Restate these sentences using “would” ( Переформулируйте эти предложения употребляя “would”) I want to go to France this summer. I want some tea. Do you want to go with me? I want to buy some coffee. He wants more milk. I want to become a doctor after I graduate. She wants to buy new tights. 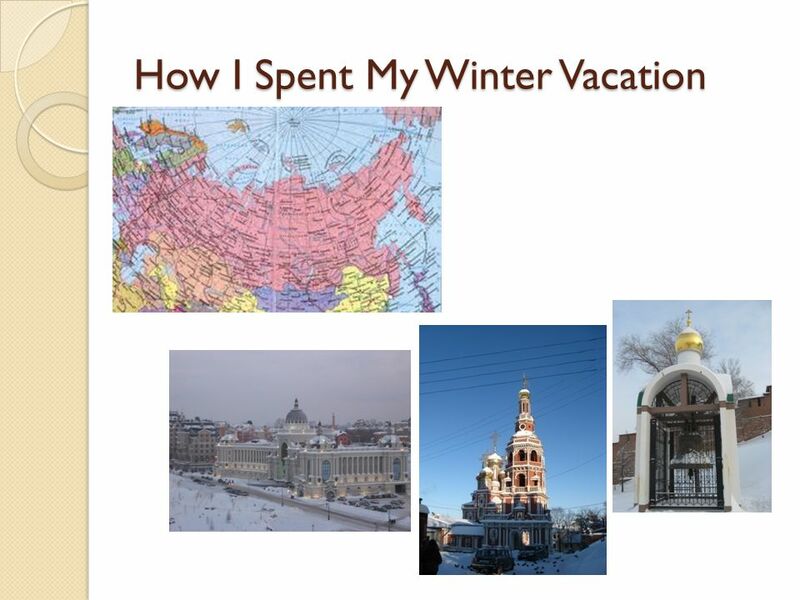 Download ppt "How I Spent My Winter Vacation. 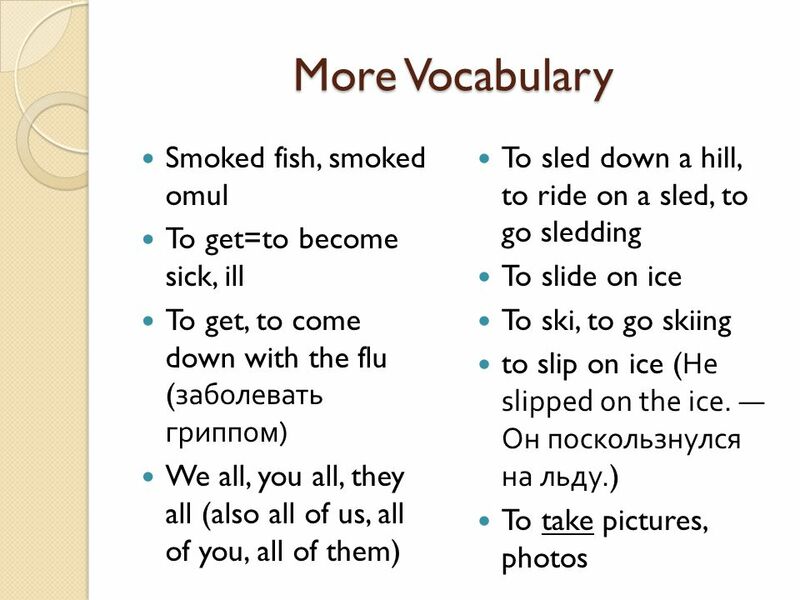 Vocabulary List To come to visit To come over To visit a museum, tourist site etc. To take a train, taxi (cab), bus, the." 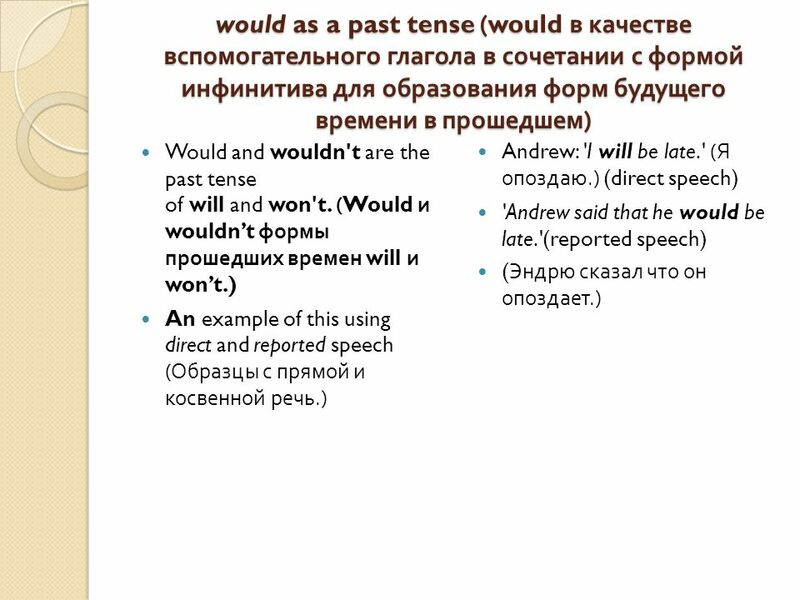 MODAL VERBS These verbs have the following characteristics: -They are followed by an infinitive without 'to'. 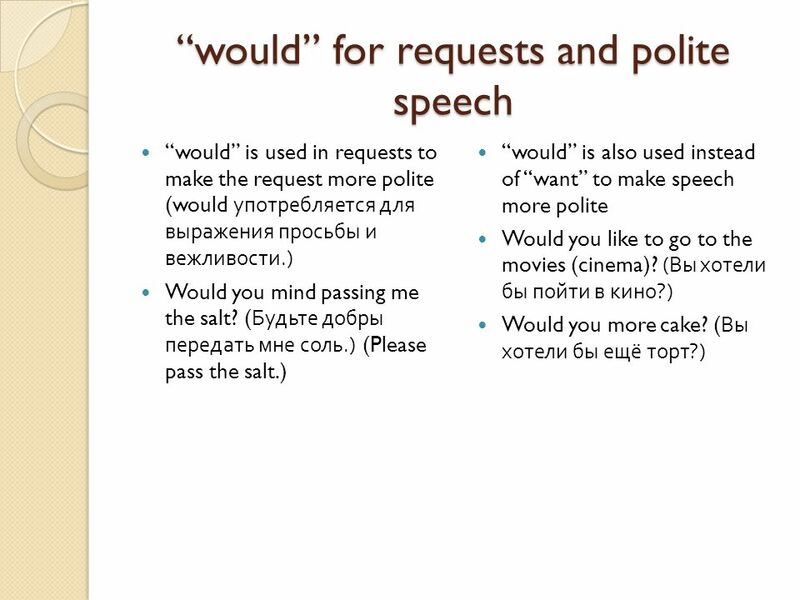 -They do not need auxiliaries for the interrogative. CONDITIONA L SENTENCES. 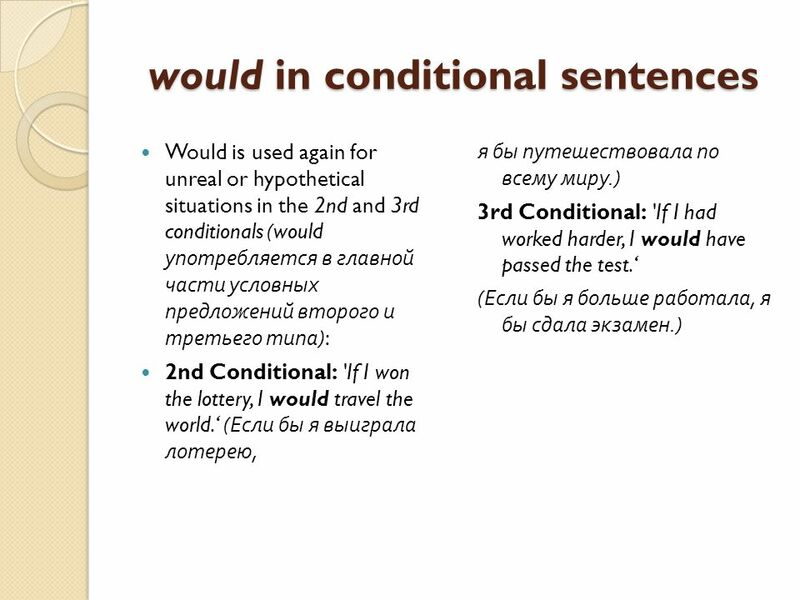 FIRST CONDITIONAL  We use the first conditional to speak about a possible present or future situation and its results:  "If.